When I was pregnant, Chris and I attended NCT antenatal classes. During them we were briefly shown how to swaddle a baby and discussed the benefits of it. I don’t think either of us really grasped how to do it properly or realised how useful it could be. 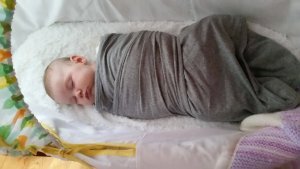 I’d tried swaddling Isla a few times, with blankets and even a special swaddle blanket from a well-known brand, but she is such an escape artist that her arms always came free, so I gave up trying! As I think I’ve mentioned before Isla has often struggled to get to sleep, and gets over-tired resulting in her screaming the place down, sometimes for hours. It’s not pleasant for any of us! When I heard about The Miracle Blanket I was eager to give it a try, as it helps babies to sleep better and longer. 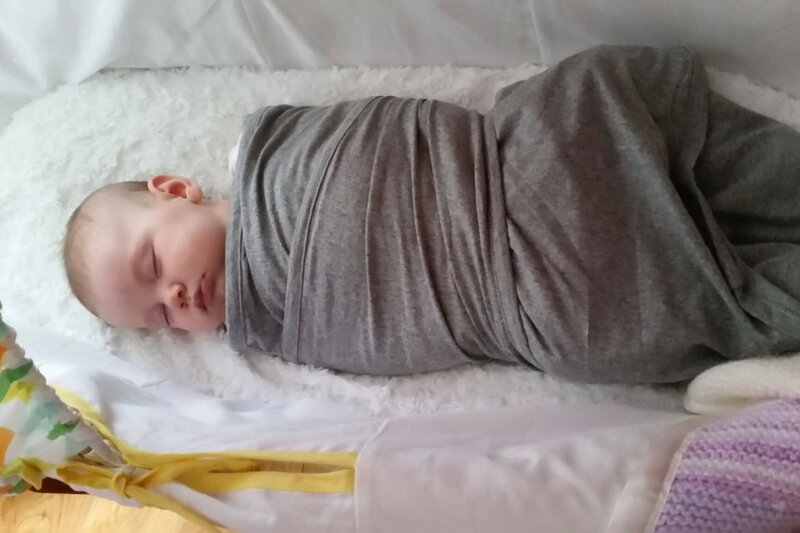 At the time I was willing to give anything a try, and thought I may as well try swaddling one last try. The Miracle Blanket is made from 100% super-soft cotton and comes in a range of patterns. I’ve got the solid grey, which suits a lot of other ‘baby bits’ we have. The Miracle Blanket comes in a one size fits all style, with the suggested age use of birth to 14 weeks. It’s unique design ensures snug, straightforward wrapping with no excess fabric (so overheating is not an issue) and it has special flaps to secure baby’s arms. The Miracle Blanket is distributed by Maguari, and sells for £19. Usually I would think this was quite expensive for just a piece of material that you wrap a baby in, but when Isla is screaming the place down because she is so tired, it is worth every penny! It comes with clear instructions on how best to swaddle your baby, and offers a couple of tips and tricks. When I first tried it, Isla wasn’t really having any of it. as with many ‘sleep aids’ she seemed to think it was meant for play time instead! I think part of my problem was I would swaddle her and put her straight down and ‘shush’ her hoping that may work. I persevered though, and changed my style. I cuddled her up in my arms, and sometimes fed her as well. Each time she was asleep within 5 minutes! When we visited Chris’ mum recently we’d had a really long day visiting both our works, long delays on the journey, and Isla’s immunisations the day before, so she really wasn’t a happy bunny. After a while of crying and screaming, and both of us trying the old favourites to get her to sleep I decided to give The Miracle Blanket a go. Chris was amazed and said I was a miracle worker getting her to sleep! Without meaning to sound cheesy I said it wasn’t me, it was the blanket! Even though Isla is now 16 weeks old I still occasionally swaddle her using The Miracle Blanket if she’s particularly unsettled and struggling to get to sleep. Once she is asleep and settled I will unswaddle her so as to prevent any risk of her rolling over in her sleep and not being able to roll back, and she stays asleep. I think this has vastly improved all of our sleeping and we feel more human for it! 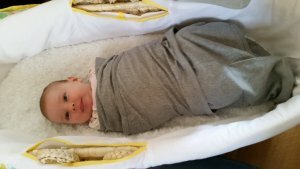 The Miracle Blanket is definitely something I would recommend, and I wish we’d discovered it sooner. If, and when we have another baby I think I’ll definitely use this from the start. Disclosure: I was sent this blanket free for the purpose of this review. All thoughts and opinions are my own.